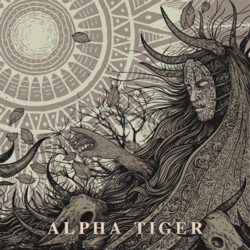 Those who feared that Alpha Tiger would become an endangered species when their vocalist Stephan Dietrich left in 2015, just after the release of their previous album ‘iDentity’, can breathe a sigh of relief once more. The recruitment of Benjamin ‘Benji’ Jaino – a guy with an incredible voice – show that this particular tiger still hasn’t lost its bite, and their resulting self-titled album (the band’s fourth) shows there’s still an awful lot the German five-piece have to say. You’d be hard-pressed to find a more powerful opener than the two-hander of intro tape ‘Road To Vega’ and ‘Comatose’, a double-whammy which clearly indicates – if such proof were necessary – that, together, Peter Langforth, Alexander Backasch, Dirk Frei, David Schleif and the aforementioned Mr Jaino make up one lean, mean fighting machine. The highlights for me fall in the middle order, where ‘Aurora’ – a song which is pretty much a metalised version of ‘The Sound Of Silence’ and treads the same plaintive path – rubs shoulders with ‘To Wear A Crown’, one of the most powerful and passionate pieces of music you’re likely to hear this year, although which fades far too early; that refrain could have played and played. Want epic? Then skip to ‘If The Sun Refused To Shine’ and get lost in the enormity of the cosmos it portrays, or the following cut (and album closer) ‘The Last Encore’ in which lyricist Langforth looks back, seemingly desolately, over his career.